[Episcopal News Service – Fairbanks, Alaska] St. Matthew’s Episcopal Church, in the business center of the Interior region’s largest city, is distinctly Alaskan in its wood and its words. Log buildings are ubiquitous Alaskan structures, both the homes and churches – from St. Mark’s Episcopal Church in the small town of Nenana to Good Shepherd Episcopal Church in the Interior village of Venetie. And in Fairbanks, St. Matthew’s presents a familiar facade to the worshippers who enter the log church on First Avenue. 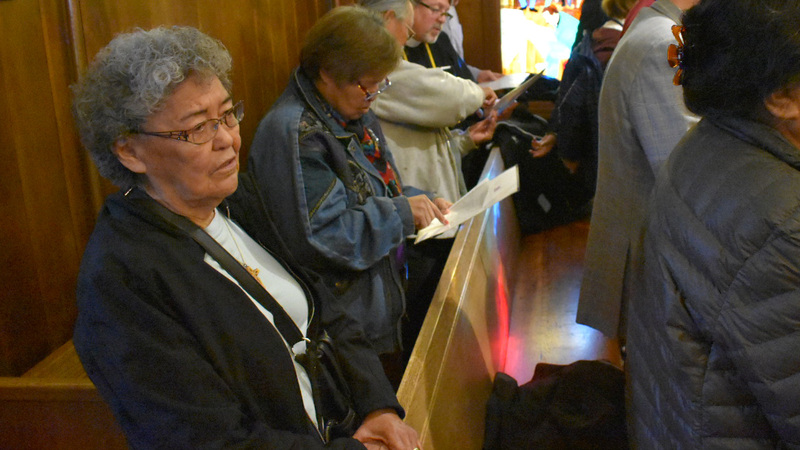 What sets St. Matthew’s apart from churches in the Lower 48 is what is said inside: Every Sunday, the congregation recites the Lord’s Prayer and doxology in Gwich’in, the Native language most common in the region. The congregation, a mix of white and Native families, doesn’t offer a full service in modern Gwich’in, however, because official services in the language don’t exist in the Episcopal Church – at least not yet. “I would love it,” said Irene Roberts, who serves as an usher at St. Matthew’s. 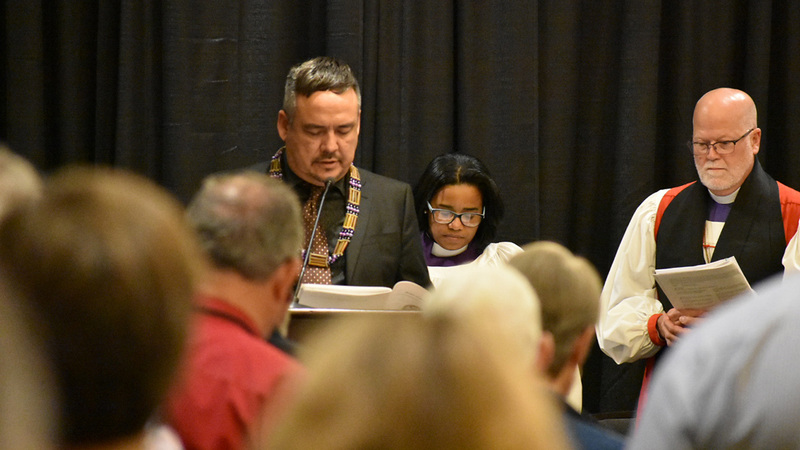 On Sept. 24, she greeted dozens of Episcopal bishops and their spouses as they filled her church’s 9:30 a.m. Sunday service, at the midpoint of the six-day House of Bishops meeting in Fairbanks. “It only took me 83 years to see this many ginkhii ch’oo,” Roberts said, using the Gwich’in word for bishops. The Diocese of Alaska, which hosted the bishops Sept. 21 to 26, is overseeing work on the first modern Gwich’in translation of the Book of Common Prayer. Those efforts got a boost this year with a $40,000 grant from the Episcopal Church’s United Thank Offering program, or UTO. When the translation is done, services in the Native language finally will be possible for any ginkhii, or priest, who wants to offer them. The Book of Common Prayer has been translated into more than 200 languages, including Takudh (pronounced “tah-GOH”), a Canadian dialect related to Gwich’in. St. Matthew’s also has a hymn book in Takudh. But the Takudh prayer book is more than 100-years-old, and Takudh isn’t the language Alaskan Natives like Roberts speak and read in their daily lives. “Some of the hymns, I know the tune, but the words are difficult for me,” Roberts said. The Takudh translation of the Book of Common Prayer was completed in the late 1800s by Archdeacon Robert McDonald, an early Anglican missionary who is credited with helping the indigenous people put their spoken language into written words. But McDonald’s translation was based on the Canadian prayer book, not the one used by today’s Episcopal churches, and it was not updated as the language evolved. The Takudh of McDonald’s translation is a dialect distinct from the modern Qwich’in spoken by many of Alaska’s Episcopalians. At the same time, the Gwich’in people of Alaska, like other Native tribes, have struggled to maintain their traditional culture, customs and way of life, and that includes their language. The younger generation is more comfortable speaking English than the language of their ancestors, said Allan Hayton, who works as language revitalization program director for the Doyon Foundation, the charity branch of one of Alaska’s 12 regional Native corporations. Hayton is a member of St. Matthew’s in Fairbanks and the head translator for the diocese’s Book of Common Prayer project. On Sept. 21, the opening day of the House of Bishops meeting, Hayton also was invited to the bishops’ 4 p.m. Eucharist to read the gospel passage in Gwich’in. He met with Native elders over the summer to being work on translating the Rite II Eucharist. 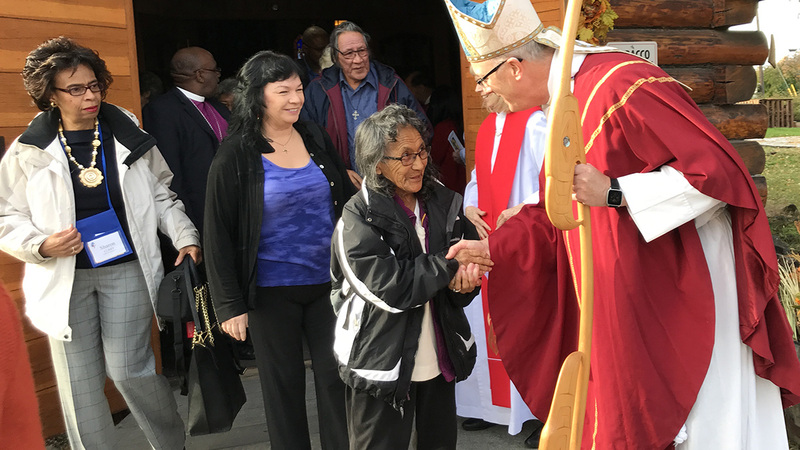 That work built on the diocese’s success in 2015 partnering with the Yukon Native Language Centre to celebrate a Holy Eucharist entirely in Gwich’in at St. Matthew’s. The scope of that earlier effort was limited, and a full translation may take years. But Hayton and church leaders think the effort will pay off in time. With the UTO grant, they hope to translate the Ministry of the Word and Great Thanksgiving Prayer A, as well as to start translation of the Collects and Prayers of the People. The goal is to publish a Gwich’in liturgical supplement that can be used alongside the English language prayer book. Translations into other indigenous languages may follow. If services can be offered in Native languages, “more people in Alaska will understand the service and might come participate,” Hayton said. “It would be easy for me,” Roberts said outside St. Matthew’s after the Sept. 24 service. She was born in Fort Yukon and later lived in the tiny village of Circle before moving to Fairbanks. Roberts is encouraged by efforts to preserve the Gwich’in language. “It makes me sad that we’re losing it.” Even in remote villages, English often drowns out the Native tongue, she said, and younger generations aren’t being taught their people’s language. She said she sometimes answers her phone in Gwich’in only to have callers hang up on her, even fellow Alaska Natives. “A lot of us are not speaking [Gwich’in] to our kids, and we should,” she said. Earlier, Presiding Bishop Michael Curry had preached at St. Matthew on the theme of family, based on the gospel reading. “Jesus came to show us how to be the family God,” Curry repeated throughout the sermon, and he took a moment to underscore the breadth of the family that Jesus had in mind.